Build My List for me Please! Every one of us has typed in the word ‘list’ plus a category behind it hoping to find that some kind soul has already compiled what we need and put it on the web. And, the wondrousness of the expansive World Wide Web often delivers. But what about those special lists that even your wildest dreams know are not likely? How do you compile those? As an example, I wanted to know the list of technology writers who attract readers that are the productive team members in their groups. Those are the people that buy our Smartsheet product. It turned out to be fairly simple and inexpensive with the Global Switchboard of work at my fingertips. Read about it here. Those all exist pretty readily you might tell me. In a sense, they do, but I also needed other data with the lists. Do they have an online offering, what is the login page, what is the traffic volume through that login site, what is the average subscription cost, how many customers do they claim, how many technology partners do they list,… and so on. Nope, the list with that data does not exist anywhere outside of an expensive paid service like Dealogix or IDC. So, give me a challenge. Propose a list that would be useful to others (not just some convoluted impossibility) and I’ll select one a week to build and publish. Simply submit your request below and you may see it in coming weeks. Include your email address if you’d like to be notified. Once we have the substance of the basic list, you’ll be amazed at how easy and efficient it is to gather all kinds of useful information about the items in that list. 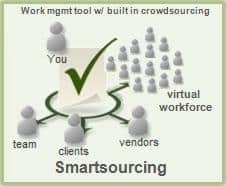 Sit back and let me Orchestrate the world’s resources from my Smartsourcing Switchboard.